What Happens if You Don’t Escape in Time? Afraid you won’t escape? Wondering how an escape game ends? We get asked this quite a bit. You are never actually lock you in a room at Hidden Key, you can get out anytime you want. This is done primarily for safety in case of emergencies. Very few people actually walk out during the game. If there aren’t any games booked after yours and you are close to success, we may let you have a few more minutes to finish puzzling on your own. If there are other games booked we have to stay on schedule and may not have the flexibility to let you finish. Either way, when your game is over, escape or not, we go over any puzzles you had questions about and show you any you didn’t get to experience. Because Escape Games generally aren’t played again we show you everything the game had to offer. Like most puzzles, the more you play the better you get. Rely on your team, communication and ask for clues when you need them! Escape is close at hand. Give it a try! Book your game now. Our online booking system is easy to use and secure. Weekend games are booking early so reserve your game today! Choose your date, time, and game, let us know how many people will be playing. If you are not certain how many will be coming, book now with the minimum you are sure will come. Bring more friends and they can pay at the door! Any problems, give us a call and we’ll help. If you are looking for a same day game, give us a call. Our booking system closes games four hours before start time but if we have time and staff we’ll add you in, just call! Payment is due at the time of booking. If you have to make a change let us know as soon as you can. We try to accommodate your busy schedule by adding in the fun when you can! Who Do I Play With? All of our games are Private Bookings, we don’t add other people to your game. Book as many of the available slots as you are sure will be coming to play. If you recruit more friends to join you, just bring them along! They can pay at the start of the game. You can play with two people, but usually it’s more fun with at least four in the group. We won’t be adding other people to your game so bring your friends, family and co-workers. Reserve it and the whole game is yours! 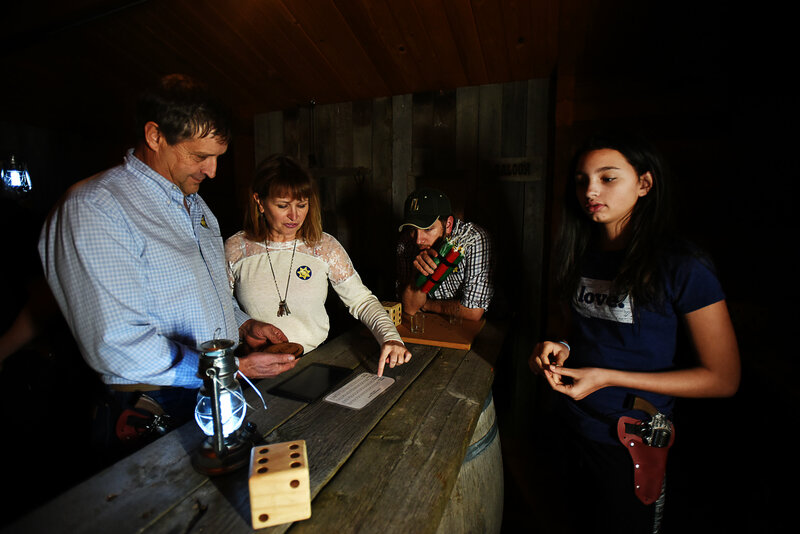 Two to ten people can play the Northfork Cabin Escape game, two to eight can play the Vigilantes. While one person may be able to complete the game, what fun is that?!? Two player teams have been able to successfully complete the game but most find at least four to be more fun. the number of puzzles available. Groups of this size are engaging and entertaining for everyone. Consequently, putting more people into the game detracts from the experience of everyone playing. You don’t have to worry about not being able to solve a puzzle. Clues are available during the game to help you. Our enthusiastic game masters will give you a clue when you ask for it if you feel stuck. You can even get an extra clue for checking in on facebook when you arrive! Most teams are just a few steps away from getting out or will escape. Teams will need most of the hour to get through all of the puzzles in the game. We test and refine our games so that they are not too easy and not too hard. They are just right! Don’t take our word for it, check out the reviews. Am I Locked In a Room? No, you are never actually locked inside a room. The way you enter the room is always available for you to exit through. This allows players who have to step out of the game the ability to do so. It also ensures that all of our guests are safe in any situation and can get out. However, you do not “escape” the game if you leave the way you come in. Every game has another way out. The fun comes from finding the clues and figuring out the story and puzzles of the room with your friends.